With the brand new Avengers: Infinity War trailer, we’ve got so! many! Avengers! There’s somewhere between like, five and 50 different Avengers in this movie and listen, we say the more the better. But while we see the likes of returning favorites like Captain America, Iron Man, and Hulk, and some newer Avengers like Black Panther and Spider-Man, I can’t help but wonder where is the best Avengers — just where is Paul Rudd’s Ant-Man in the Infinity War trailer? Mr. Paul Rudd, as you should alreayd know, has suited up as Scott Lang/Ant-Man in the Marvel Cinematic Universe. He’s pretty great as Ant-Man, just saying. Rudd has his second Ant-Man solo outing lined up with Ant-Man and the Wasp, but that actually comes out two months after Infinity War. We know Rudd is going to be in Infinity War as Ant-Man, but we unfortunately don’t get a look at him in the new trailer. OR DO WE? Ant-Man is small, remember. That’s like, his thing. If you look closer, and enhance some (now iconic) moments from the Infinity War trailer, you can actually see Ant-Man in them. 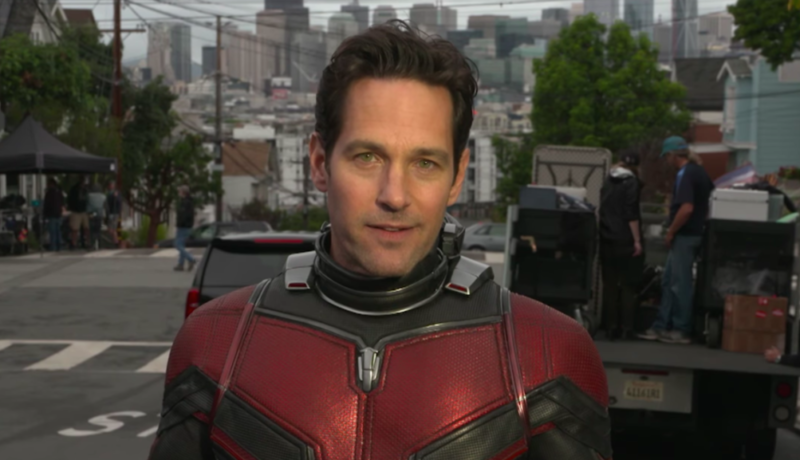 So for those of you who might have missed him in the first, or fortieth, viewing of the trailer don’t worry — we’ve rounded up the best Paul Rudd moments here. 1The first time we see Ant-Man is just after he’s taken out Bruce Banner’s Hulkbuster armor all by himself. Probably that’s what’s just happened here. Then he awkwardly watches Bruce and Natasha from a distance, trying not to disturb their moment. 2Ant-Man, the strongest Avenger (not up for debate) accidentally crashes through the stairs at Bleeker Street and is then like “look over there! !” in order to divert attention away from himself. 5Ant-Man’s so brave, he tries to stop Loki handing over the Tesserac, but that glowing cube is more powerful than Scott realizes. 6In a rare moment where he’s big, or more appropriately a “regular sized human,” Ant-Man is ready to head into battle with Black Panther. 7Never wanting to miss out on a good fight, Ant-Man can be found clutching onto Cap’s shoulder during (what is presumed to be) a giant Wakanda battle. These two make a great team!! 8Avengers + Ant-Man assemble!! Here, Ant-Man continues to clutch onto Cap’s shoulder as the first line of defense. Can we get a stand alone Scott and Steve movie? 9Oh, did you think Ant-Man wasn’t going to go to SPACE? Ant-Man goes to space. You can spot him quick in the corner of Peter Quill’s Milano! Catch Ant-Man and the other 700+ Avengers in Avengers: Infinity War on May 4th, 2018.